Rococo style is delicate, yet elaborate, beginning around Louis XV’s (1715-1774) reign of France and influenced by Madame de Pompadour. Architectural decoration was based on arabesques, shells, elaborate curves and asymmetry. 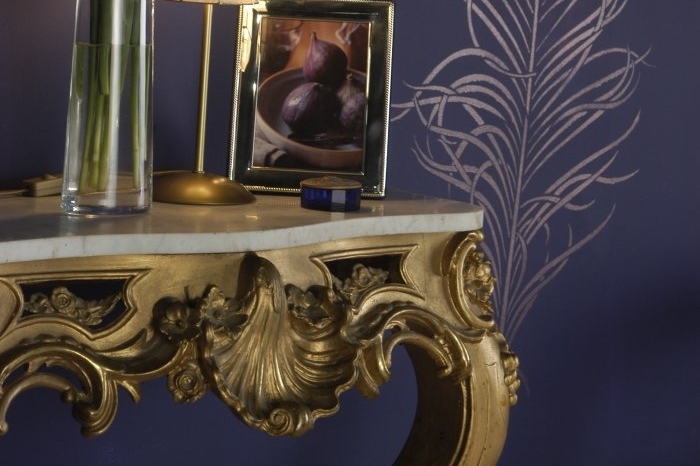 Important features of Rococo interiors included use of mirrors and beautiful furniture to create incredible lavishness. A gentle, symphonic light blue-grey. Cool and soothing, it is ideal for studies, libraries and reading rooms. Use with 1829 White Undercoat. Expressive, elegant blue named after the sophisticated Madame de Pompadour - a leader of 18th century taste. Use with 1829 Light Grey Undercoat. A distinctive blue found in textiles made by skilled Flanders weavers evoking landscape and earthly beauty. Use with 1829 Light Grey Undercoat. Panna cotta rich but not too sweet, this dark cream works well as a backdrop in kitchens and larders. Use with 1829 White Undercoat. A smooth chestnut puree; dark and custardy. A versatile shade, but especially good with natural timbers. Use with 1829 Light Grey Undercoat. Inspired by 18th century tapestries, this intense silken cream offers a rich backdrop to wood and natural linen. Use with 1829 White Undercoat. Rich ochre shade with hints of saffron. A versatile, warm background for simple interiors with clean lines. Use with 1829 Light Grey Undercoat. A rich earthy red frequently seen on Shaker barns or grain stores. Wonderful for a dining or reading room. Use with 1829 Light Grey Undercoat.